State board of technical education and training postponement the examination is the trending news for diploma students. The election commission is giving notice about the timetable not only for sbtetap but it also gives all educational boards to rescheduled the examination in these days,9th to 12th April-2019 and 22nd to 24th May-2019.In present sbtetap, March/April-2019 timetable 9th April-2019 exam is the postponement to 25/04/2019, In below the paragraph providing which subject is the postponement to 25th April-2019. Those who are studying diploma they are waiting for the 2019 examination time table. 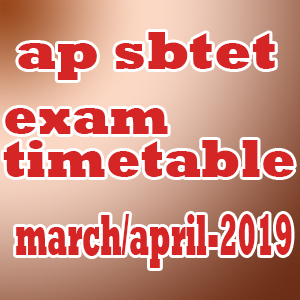 It was updated soon in SBTET AP gov.in website officially, manabadi sbtetap exam timetable is also provided the timetable link, Below this post we providing the direct link for downloading PDF. In this sheet postponement subjects list in c-09 c-14 c-16 regulations March/April-2019. Click below to download the timetable 2019, for c09 c14 c16 regulations directly for regular and supply students. c-09 Diploma in Automobile Engineering timetable | c-09 Diploma in Architectural Assistantship Engineering timetable | c-09 Diploma in Applied Electronics & Instrumentation Engineering timetable | C 09 Diploma in Bio-Medical Engg timetable | C 09 Diploma in Civil Engg timetable | C 09 Diploma in Computer & Commercial Practice timetable | C 09 Diploma in Chemical Engg timetable | C 09 Diploma in Chemical Engg (Oil Technology) timetable | C 09 Diploma in Chemical Engg (Petro chemicals) timetable | C 09 Diploma in Chemical Engg (Polymers & Plastics) timetable | C 09 Diploma in Chemical Engg (Sugar Technology) timetable | C 09 Diploma in Computer Engg timetable | C 09 Diploma in Electronics & Communication Engg timetable | C 09 Diploma in Electrical & Electronics Engg timetable | C 09 Diploma in Garment Technology timetable | C 09 Diploma in Hotel Management & Catering Technology timetable | C-09 Diploma in Information Technology timetable | C 09 Diploma in Mechanical Engg timetable | C 09 Diploma in Metallurgical Engg timetable | C09 Diploma in Mining Engg timetable | C 09 Diploma in Petroleum Technology timetable | C 09 Diploma in Refrigeration & Air Conditioning Engg timetable | C 09 Diploma in Textile Technology timetable . c-14 Diploma in Automobile Engineering timetable | c-14 Diploma in Architectural Assistantship Engineering timetable | c-14 Diploma in Applied Electronics & Instrumentation Engineering timetable | c-14 Diploma in Bio-Medical Engg timetable | c-14 Diploma in Civil Engg timetable | c-14 Diploma in Computer & Commercial Practice timetable | c-14 Diploma in Chemical Engg timetable | c-14 Diploma in Chemical Engg (Oil Technology) timetable | c-14 Diploma in Chemical Engg (Petro chemicals) timetable | c-14 Diploma in Chemical Engg (Polymers & Plastics) timetable | c-14 Diploma in Chemical Engg (Sugar Technology) timetable | c-14 Diploma in Computer Engg timetable | c-14 Diploma in Electronics & Communication Engg timetable | c-14 Diploma in Electrical & Electronics Engg timetable | c-14 Diploma in Garment Technology timetable | c-14 Diploma in Hotel Management & Catering Technology timetable | c-14 Diploma in Information Technology timetable | c-14 Diploma in Mechanical Engg timetable | c-14 Diploma in Metallurgical Engg timetable | c-14 Diploma in Mining Engg timetable |c-14 Diploma in Petroleum Technology timetable | c-14 Diploma in Refrigeration & Air Conditioning Engg timetable | c-14 Diploma in Textile Technology timetable C-16 Diploma in PetrochemicalTechnology.